Sunday Scaries CBD Gummies and Vegan CBD Gum Drops are a great way of taking your CBD as you get to control the dose accurately. The fact that you also get a great tasting and fully approved product that’s safe and contains the best quality CBD is just a bonus. The wonderful world of CBD can be a scary place; especially for people who have never tried CBD before and aren’t sure what to expect from a wellness supplement that is relatively new. 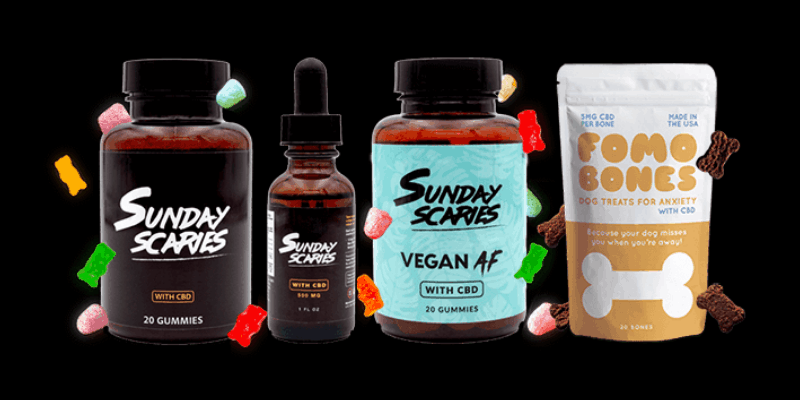 Sunday Scaries is one CBD company in the industry that sells some of the best CBD Gummies and CBD Oil Tinctures on the Internet. Don’t let their brand name scare you off though, as they explain on their website with their definition of what “Sunday Scaries” is: “It’s the ping of anxiety you feel in the pit of your stomach on Sunday afternoon when you realize tomorrow is Monday aka the end of freedom and the beginning of the rat race.” Can you relate to that? Most people can on some level, and that’s where CBD can come in handy and sometimes even fend off those Sunday Scaries before they kick in. Sunday Scaries source only the best CBD Extract available and sell a fantastic range of great-tasting products including CBD Gummies, CBD Oils, and CBD for pets. 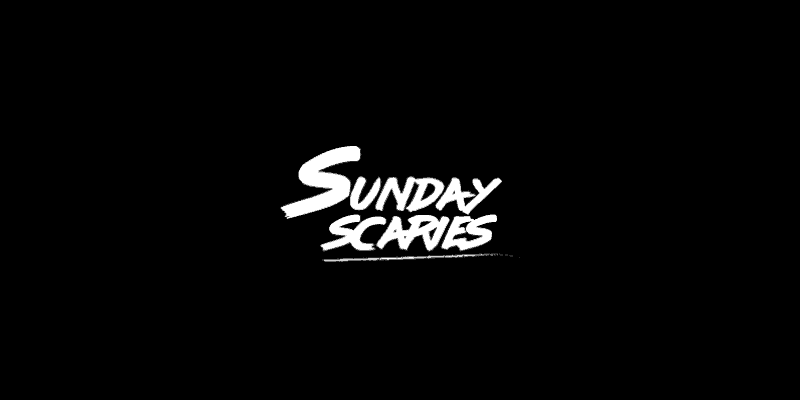 They also sell a great range of bundle packages that save you a bunch of money at checkout, but if you’re interested in Sunday Scaries products, we will also be offering you a further 15% off their whole range with our amazing CBD Coupon Code at the end of this Sunday Scaries brand review. Sunday Scaries is the brainchild of Mike and Beau; two close friends who simply couldn’t wait to break open the CBD industry with some of the best products available today. Soon after a close friend of theirs called Garrett introduced them to CBD, it was love at first sight as the business partners had both been suffering from anxiety from all the strain they were under. The mild euphoria they felt along with the sense of calm they encountered after taking CBD for the first was remarkable to them, and they knew they had to do something to help other people in the same boat as them. Mike and Beau started using CBD regularly but grew tired of paying nearly ten bucks a day on CBD Water. They wanted to create a product that contained the best CBD for anxiety, at precisely the perfect dose, and with a great flavor – all at an affordable and realistic price. They source all of their CBD Extract from family-owned farms in Colorado and keep within the requisite regulatory requirements within the CBD industry. You can see that the team at Sunday Scaries do things differently as soon as you look at the label on their products. They contain useful and transparent information that beginners need, including supplement facts and a list of ingredients. Each CBD Gummy Bear contains 10 mg of CBD, giving customers the option of taking just one or tapering up to the dose that works best for them. Let’s take a look at three of Sunday Scaries’ best selling CBD Products, and keep an eye out at the bottom of this brand review for a fantastic 15% off CBD Coupon Code. When you buy CBD online, the first thing you need to feel confident about is safety and purity. That’s why it’s always recommended that you purchase your CBD from a reputable vendor like Sunday Scaries, so you have peace of mind – safe in the knowledge that you are getting the very best CBD Extract. We are featuring some fantastic CBD Gummies, including CBD Gummies for Vegans and an amazing range of bundle options that can save you some serious cash at checkout. Sunday Scaries CBD Gummies are described by them as a “giant hug to your nervous system.” They incorporate a proprietary blend of the best quality, full-spectrum CBD, alongside Vitamin B12 and Vitamin D3 to boost the immune system further. While Sunday Scaries CBD Gummy Bears are made in the USA, they also contain no fillers as every ingredient has a purpose and a place. Vitamin B12 is known to regulate the nervous system, while Vitamin D3 is used by many people to boost the immune system. There’s also best quality Coconut Oil in the mix alongside just a touch of Pure Cane Sugar for that bit of natural sweetness. Sunday Scaries CBD Gummies contain 10mg of CBD per bear and come in handy bottles of 20. For some people there can be no compromise when it comes to eating animal products or those tested on animals. Veganism is an increasingly popular trend these days as people turn to plant-based diets for healthfulness and wellbeing. CBD is following a similar trend too, as it has just those effects for many people so it’s natural that Veganism would meet CBD somewhere along the way. 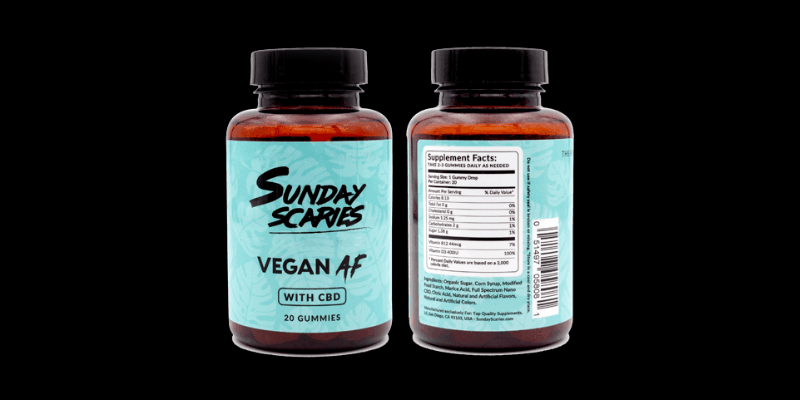 Sunday Scaries Premium Vegan CBD Gummies are similar to other gummies but contain zero gelatin or animal derivatives, just finest CBD without any guilt. 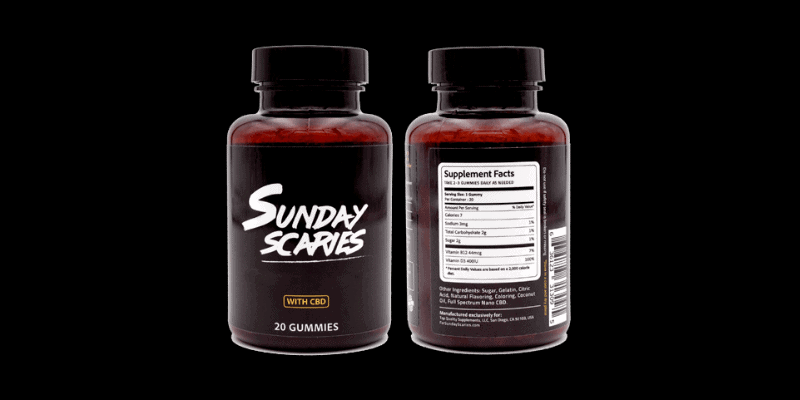 Sunday Scaries recommend you take 1-3 CBD Gummies at a time, depending on your needs and within 20-30 minutes you could feel your Sunday Scaries melting away. Keep in mind that it can take up to two hours for the full effects of the CBD to be felt, so it’s worth being patient. When it comes to buying CBD – especially for regular or long-term users – things can get expensive, as with most natural health supplements. That’s why CBD Bundles are a great way of saving money, and Sunday Scaries has not just one but five great bundles to choose from. There’s their Dynamic Duo Bundle which features Sunday Scaries OG Gummy Bears and Vegan AF Gum Drops. The CBD Flight Bundle has more of the same but including a bottle of Sunday Scaries CBD Tincture. Their Man’s Best Friend Bundle includes one bottle of CBD Gummies as well as a bag of CBD Fomo Bones for your pet pooch. The Full Chill Bundle will give you two bottles of gummies, CBD Tincture and CBD Fomo Bones, and you’ll enjoy great saving when buying CBD Bundles from Sunday Scaries. With all the great CBD products on the market today it can be hard to navigate your way through to find the best CBD solution for you. If you suffer from insomnia from time to time, for example, you may need a lower dose of CBD than if you suffer from bouts of anxiety or stress. That’s why Sunday Scaries CBD Gummies and Vegan CBD Gum Drops are a great way of taking your CBD as you get to control the dose accurately. The fact that you also get a great tasting and fully approved product that’s safe and contains the best quality CBD is just a bonus. But the 15% discount we have secured for you through our CBD Coupon Code is the icing on the cake as you can start saving today as you embark or continue on your CBD journey. Simply add “BESTDOSAGE” in the relevant coupon code box on the checkout page, and you’ll automatically see a 15% discount on your purchase. You can also feel free to reach out to the dedicated team over at Sunday Scaries, who will be happy to answer your questions and queries and steer you on the right path to health and wellbeing.